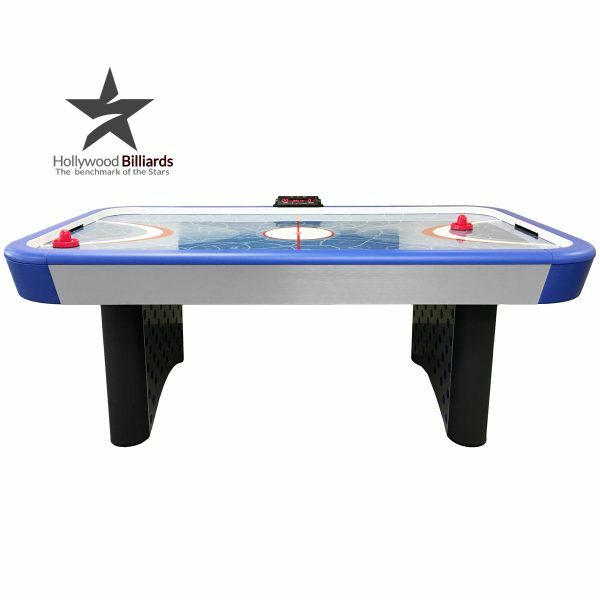 Great fun for the family is yours with the Imperial 7-foot Air Hockey Table with electronic scorer. The cabinet and legs are made of durable MDF covered in PVC vinyl that provides great looks for many years. The pedestal legs provide stability even under aggressive play. The powerful motor provides full air circulation on the entire playfield. The electronic scorer is placed on the rail at the mid-line for easy viewing by all players. Puck returns on each end of the table. Overall table size is 84″ x 48″ x 32″; 187 pounds. Playfield is 76″ x 40″. Includes 4 pucks and 4 strikers. Motor specifications: 120 VAC, 60 HZ, 1.2 AMP. Boxed dimensions: 87″L x 51″W x 9″H; 190 pounds.